Snowflakes! They are truly a wonderous thing. I have been fascinated with snowflakes since I was a small child trying to catch them on my tongue. I also loved to hold my red mitten out to see them land and then examine each tiny flake. They are so beautiful. As you know if you have been reading the blog for a while, I love to put together lists of the best books for boys and I am hoping your boys are going to enjoy this one. 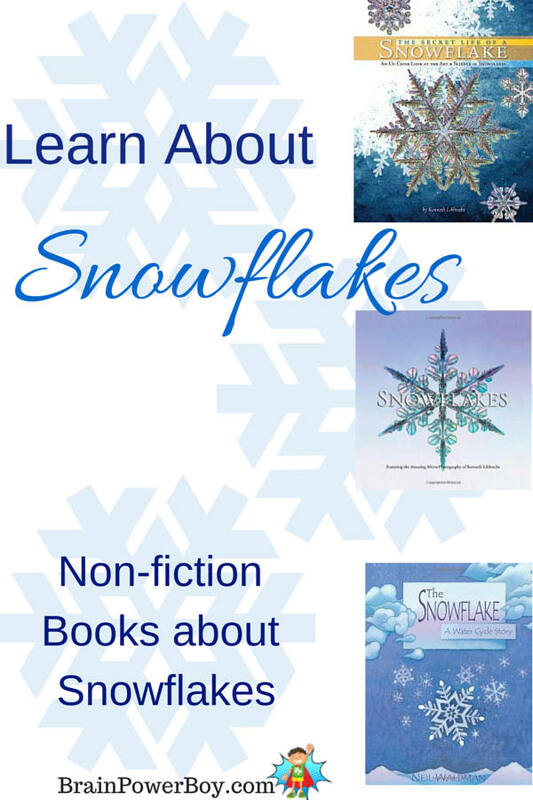 I started with the classic Caldecott Medal book Snowflake Bentley and went on a search to find some great books to share that were all about snowflakes. Reading these books ensures your boys will learn something interesting about snow, the makeup of snowflakes and really experience the beauty and wonder of these tiny crystals. If you live in a snowy place, like we do, snowflakes are a part of life. We really enjoyed studying these books to learn more about snowflakes and enjoyed the beautiful photography as well. We will start out with the book I already mentioned, Snowflake Bentley . If you have not yet read this book you really need to give it a try. It is based on the life of a boy who loved snowflakes and parents who, in the end, supported him in his passion. Snow Crystals by W.A. Bentley (yes, the Snowflake Bentley from the book above) has very detailed explantions of snow crystals and dew drops. Great reading for those interested or for older boys. The wonderful thing about this book is the collection of images of snowflakes which make up the majority of the pages. If you want to know more about snowflakes and how they form try The Snowflake : A Water Cycle Story . It is a bit of a poetic story of a snowflake coming down and its journey through the seasons and back to becoming a snowflake once again. Snowflakes is not a children’s book per se but I am including it here because, well . . . I love it. It is a small sized book, which I am fond of and it is thick. The book has beautiful micro-photography full page images of single snowflakes. It also includes some lovely quotes. The photographer, Kenneth Libbrecht, includes little explanations and interesting facts about the crystals as well. Nice! The Story of Snow: The Science of Winter’s Wonder tells us how snowflakes form, what shapes they can take on and what happens when they land. They do a great job of making things easy to understand. If you need to know the answer to the question “Are no two snow crystals alike?” this is the book for you. The Snowflake: Winter’s Secret Beauty is a book for older kids or those who really want to know the details. It is another up-close look at these lovely crystals with longer text on each topic including photographers (Bentley and others) snowflake watching, symmetry, best snowflake weather, a field guide to falling snow and more. Told you it was detailed! Last but not least, is The Secret Life of a Snowflake .This is a great pick for learning the details of snowflakes. I like how things are explained. The author is passionate about snowflakes and it shows. They also include the “right way” to make a paper snowflake–which turns out really neat! This book is a mini unit study on snowflakes on its own but there are also very nice companion books. The link is for a list of his books. As I said, I really love snowflakes and I hope you and your boy will enjoy learning more about them. These books are tops on the subject so be sure to take a peak into the wonderful world of snow crystals. Thanks much for stopping by. If you like this list–please share it! my 9 year old son is very much into non-fiction and would love some of these books. What a great and fun topic to post about. So nice of you to leave a comment. My son is a big non-fiction fan as well and we are really enjoying these titles. I hope he likes them. Found you through the Thoughtful Spot link-up. I love non-fiction for kids and am looking forward to sharing your list! We read the snowflake a water cycle last year when we were studying snow but I haven’t seen the other ones so I will have to check them out!! I liked that book on the water cycle. Glad you found some more to check out. Thanks for leaving a comment! Thanks for the nice comment Sharon and for hosting the party. Thanks for this list. We have lots of snow this year and have read Snowflake Bentley very often. A few new ones for older kids would be great! Thank you. You are most welcome. Glad you found something to use with your older children.